This is a size 7, keep reading to see how you can make this in lots of sizes. 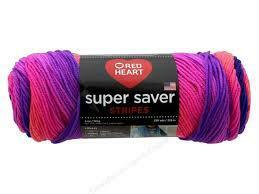 Red Heart Super Saver Stripes, color Flamenco Stripe. This yarn can vary between 8 and 10 ply, US DK and Worsted weight. Hook size: 4mm/G-6. 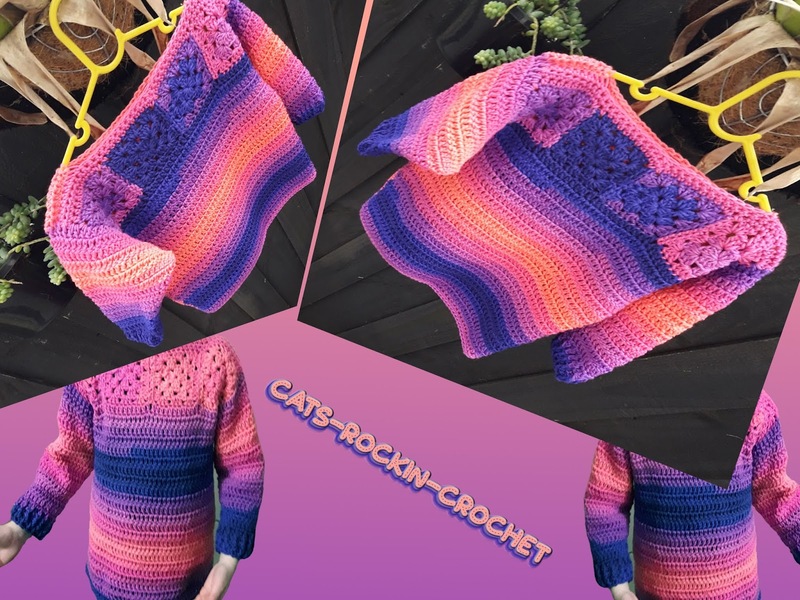 I used this size hook as the variation of the yarn size was equivalent to 8 ply. 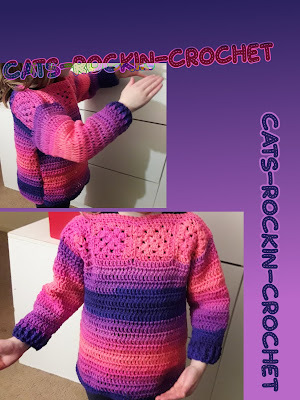 I took a sweater that fitted Miss 7 and made some small granny squares that fit across the neck line of the sweater. 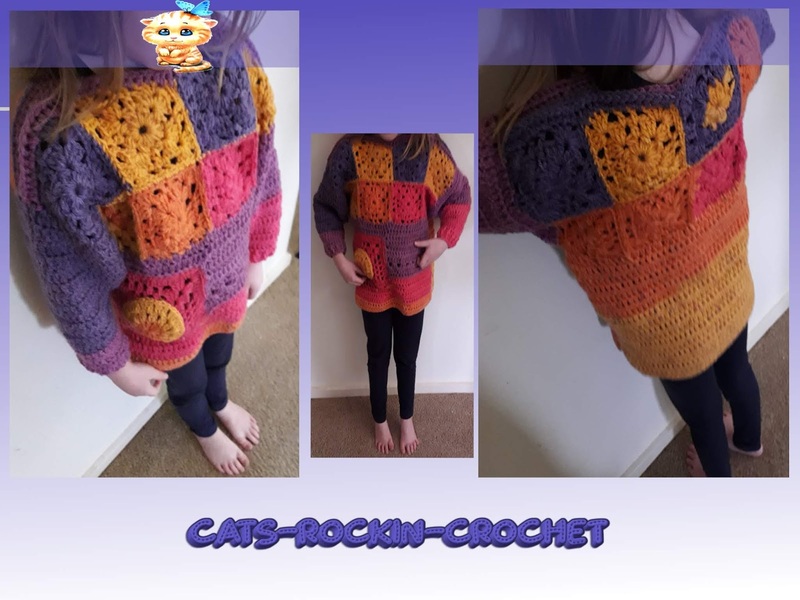 I initially did 4 rounds of the granny square but that was too small and too big, so I then did 3 rounds and it fit pretty good, my next option to alter sizing would have been to add more chains between the 3 dc's or in the corner where I only had 2 ch's. I made a dc in each ch space and dc of the granny squares, which gave me 44 dc's. I then worked back and forth for approx 5 rows, I then added an extra stitch on each end for 4 rows. The stitch markers in the above picture show the rows I increased on. 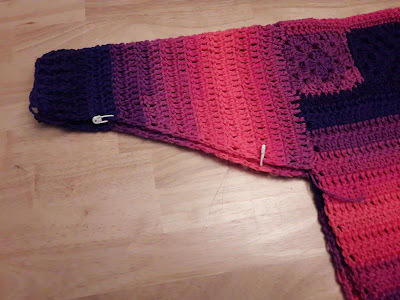 I then continued to work back and forth for the length of the sweater I was using for the shape, making the last 2 rows with a hdc, to get a firmer edge. 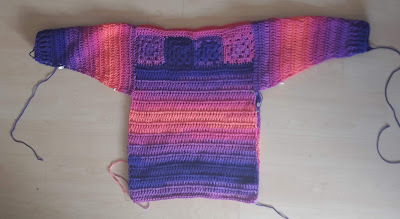 I added a row of hdc to the neck line of the granny squares. I then made another piece exactly the same and sl st the shoulders together. 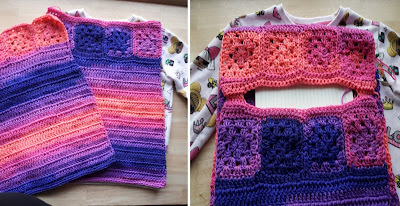 The sleeves would start and end on the 5th row down from the granny squares (just before the increases) on both the front and the back panels. 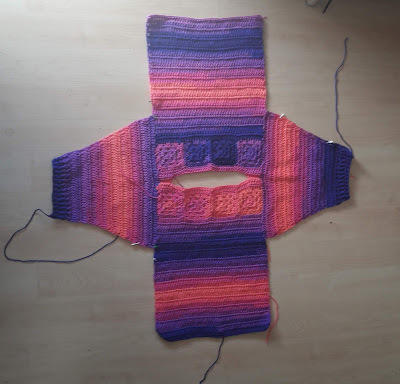 I made a total of 3 rows back and forth, before I started to decrease on each end to shape the arm. I had approx 54 st's to begin with and I ended with approx 28 st's. I made another 7 rows, with the final 2 being fpdc and bpdc to form a ribbed cuff. This is what it looks like laying flat after both sleeves have been made. To finish, sew in all loose ends and whip stitch together. You can make any size you like just by using the correct sized sweater as a template. This was a fun little project and I plan to make more, thanks for viewing and I hope you find these instructions useful. 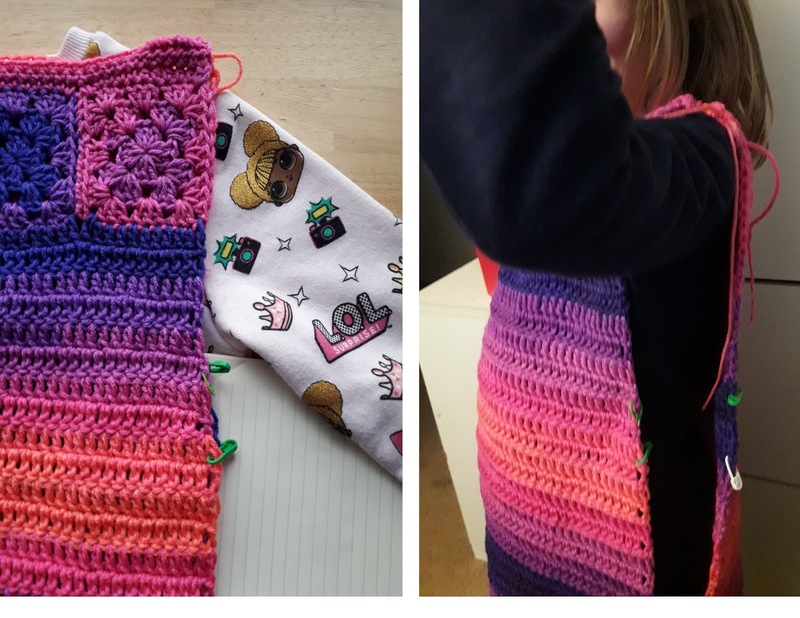 Here's an update on another one I made with Caron Cakes.